85% of those surveyed considered promoting the rights of women and girls a very high priority. 74% agreed that the U.S. government should actively work to promote human rights in other countries. When given a choice among the rights that the U.S. should promote, 51% ranked women’s rights as first or second, second only to “free and open elections” and ahead of freedom of religion, freedom of the press, and the rights of workers and unions. Two-thirds agreed that more participation by women would make the world more peaceful. Most respondents would support women’s rights overseas even if that meant less consumer choice from international trade, fewer exports, or more disagreement with America’s friends and allies. 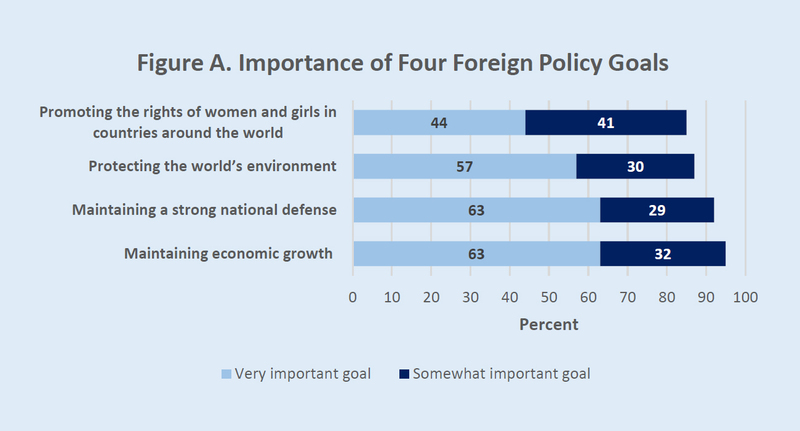 However, the intensity of support for women’s rights declined when tradeoffs were presented, and fewer Americans said that women’s rights are a “very important goal” for U.S. foreign policy compared to the environment, a strong defense, or the U.S. economy. 33% percent of respondents said that they would be more likely to support a congressional candidate who promoted women’s rights in foreign policy, compared to only 6 percent who said they would be less likely to support such a candidate. Democrats were more likely to say that this issue would affect their choice in the 2018 election. Funding for this survey was provided by the office of the University Provost under the Tufts Collaborates program.